Hartlepool’s wide men will need to be stopped if FC Halifax Town are to have a Good Friday, according to Liam Kennedy, who covers the club for the Hartlepool Mail. Hartlepool are one place below Halifax in the National League but level on points, having won 13, drawn 14 and lost 16 league games this season. They have lost more than they’ve won at home this season in the league, and conceded more than they have scored. Former Middlesborough defender Matthew Bates started the season in charge, but was replaced by Richard Money in December. However, just over a month later, Money was moved upstairs to oversee recruitment and the club’s youth set-up, while director of football and former boss Craig Hignett was re-appointed as first-team manager in what was effectively a job-swap. Since his appointment, Hignett has won four, drawn five and lost four. “Since Craig Hignett took over performances have improved significantly,” Kennedy said. “The club’s league position has not. Results are better but nothing you’d shout from the rooftops. When asked what can Halifax expect from them on Friday, Kennedy said: “A team with little to nothing left to play for. 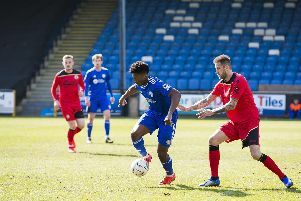 “Manager Hignett has used the fact virtually every single player in the squad is out of contract as the main drive to keep performances going until the end of the season. Kennedy said Pools started the campaign as one of the dullest sides around. “Goals were hard to come by, but clean sheets were not,” he said. “This has gone full circle under Hignett. “Pools have struggled to keep things tight, although that is getting better, and they do now look like scoring goals against anyone. Liam Noble is the club’s top-scorer but he is unlikely to be in the starting 11. “Pools main threat on Friday is likely to come from Luke Molyneux,” said Kennedy. “He is a winger on loan from Sunderland. The youngster spent the first half of the season on loan at Gateshead. “He is a left-footed player who enjoys cutting in from the right. His delivery from dead balls is also one to watch out for. 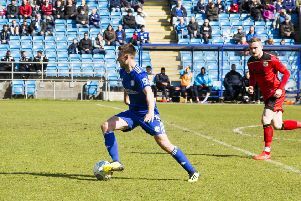 “England C international Luke James might not score too many goals, but he is a constant nuisance for every back four, or three, he faces at this level. “Former Middlesbrough and Scunthorpe United attacker Luke Williams is a player who has taken up plenty of column inches this season. He was one of the club’s marquee signings in the summer, dropping down from League One on big money. “But having had an illness, then two knee ops this season, he is yet to kick a ball. And last week the news came that Williams would not be fit enough to take part in any of the club’s final two games. “Defender Carl Magnay and midfielder Conor Newton are the only two other long-term absentees. “Magnay has an outside chance of making the game. Likely line-up: Scott Loach (GK), Peter Kioso (RB), Fraser Kerr (CB), David Edgar (CB), Myles Anderson (LB), Nicky Featherstone (CM), Ryan Donaldson (CM), Gavan Holohan (CM), Luke Molyneux (RF), Nicke Kabamba (ST), Luke James (LF).